Home > New on the market > Skincare > Egyptian Magic Cream – Does magic really work? Recently I got in my hands a sample of product that dominates social media as a magical beauty recipe among Hollywood stars – Egyptian Magic All-Purpose Skin Cream. After reading many positive opinions online that supported my personal feedback, I decided to supply myself with one 59 ml jar to test its “magical” properties. You can read below about how Egyptian Magic Cream performed in user test. What is so attractive in Egyptian Magic Cream? Firstly, composition based on six fully natural active ingredients. Egyptian Magic Cream is a composition of honey, olive oil, bee products (royal jelly, wax and pollen) and propolis. As a fan of natural cosmetics I am very fond of that. Secondly, the reviews of the biggest film stars, musicians and models. All-Purpose Skin Cream is used by such stars like, Madonna, Kate Hudson, Emily Blunt, Eva Mendes or Karolína Kurková. I just couldn’t refuse myself using the same cosmetic! Thirdly, multitasking. Egyptian Magic All-Purpose Skin Cream has various properties: nurturing (moisturises, protects), regeneration, healing (supports any therapy, relieve symptoms). For a very long time I was searching for a product that could offer me the solution to so many various issues! Fourthly, very long expiration date. In contrast to other cosmetics based only on natural ingredients, Egyptian Magic Cream can be used for up to three years! And all of that thanks to the antiseptic and oxidative properties of honey and its derivatives. What is the Egyptian Magic All-Purpose Skin Cream? While talking about Egyptian Magic Cream I have to mention its texture. Every jar consists thick and greasy cream with matt surface, that melts with any contact with warm skin and applies with no problem. Egyptian Magic Cream has small lumps (reminding me a bit of fine sugar scrub), however, they don’t make the usage any more difficult. All-Purpose Skin Cream is a product for any type of skin – in my case it is best absorbing in places where skin is exceptionally dry (i.e. on elbows), and if it comes to face (I have mixed complexion) it leaves oily film. Does Egyptian Magic All-Purpose Skin Cream works? With full responsibility I can say that Egyptian Magic Cream works. I apply it every evening on the most problematic parts of my body (dry elbows, prone to acne jaw and locally placed rash on the thighs) for over a month. Effects can be observed with the naked eye – acne appears occasionally, skin on elbows doesn’t peel as much any more and the only relief on the thighs’ rash brings precisely Egyptian Magic Cream. 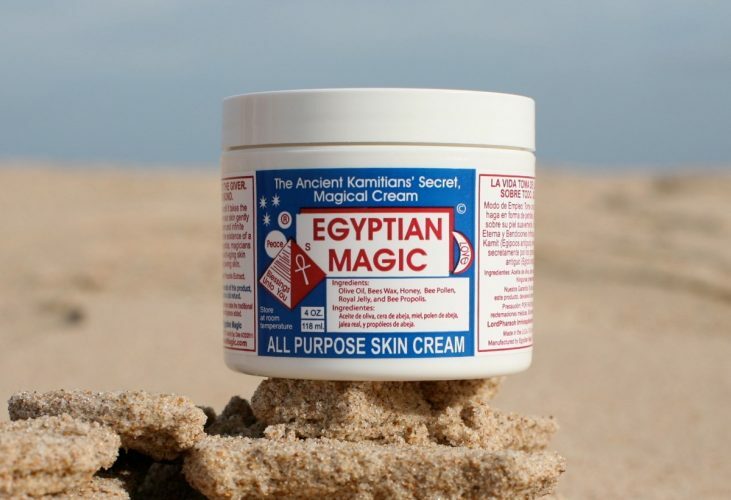 Aside from immediate relief, moisturising and healing effect, quite big advantage in my opinion is efficiency of the product – in my case I think that Egyptian Magic Cream will last for at least half year of intensive usage!